Like many parents, you probably want to have your kids to have the best backyard playsets. This way, they can play with swings, slides, and other equipment without having to go to the park. Of course, they’ll become more encouraged to play outside in the sunshine instead of spending their time in front of a screen. Priced at around $1,300, this swing set might seem too expensive at first glance. But, with its 800-lb capacity and sturdy redwood construction that offers 10 activities, it’s actually great value for your money. 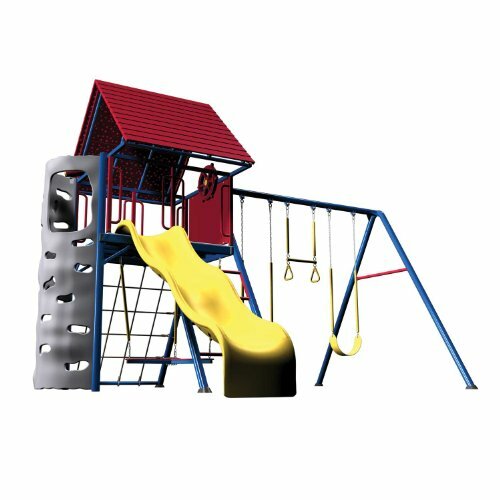 Through this play set, your child can play with two belt swings, one trapeze swing, a wave slide, and a rock climbing wall with attached rope. He’ll also have access to a telescope, a tic-tac-toe panel, and a sandbox. The chimney, dormer windows, and wood roof sunburst designs add an elegant touch. Total area of unit- 13' 11" x 15' 9"
The first thing you’ll notice about this freestanding play set is its durability. It’s made of powder-coated steel and high-density polyethylene, which means it can resist all types of weather and last for years. It comes with a clubhouse, two belt swings, a nine-feet wave slide, a climbing wall, and a propeller swing, along with an activity board and a ship’s wheel with binoculars. It comes in at around $1,800. Your child will burn calories,strengthen muscles,and enhance full body coordination. You don’t need to have a large budget to have a backyard play set. With this set, you can keep 6 kids busy and happy for less than $300! It comes with a trampoline, a slide, two slides, and monkey bars, and it even has a canopy that protects your kids from the sun. You can even add a kiddie pool to the bottom of the slide to turn it into a water slide! It’s a great way to encourage your children to play outdoors without spending too much. 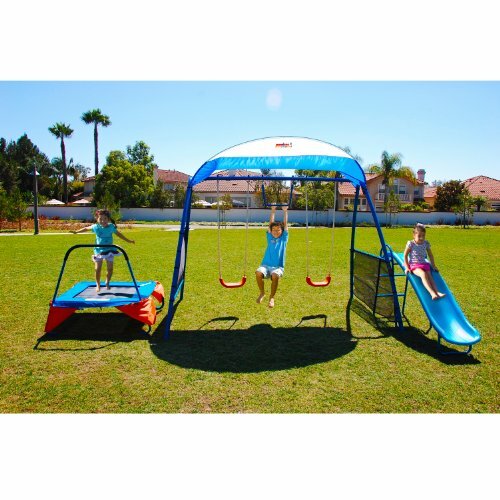 If you have a toddler or preschooler, you’ll love the Little Tikes Clubhouse Swing Set. It’s specially designed for kids from two to six years old, so you know your children can have fun without having to worry for their safety. 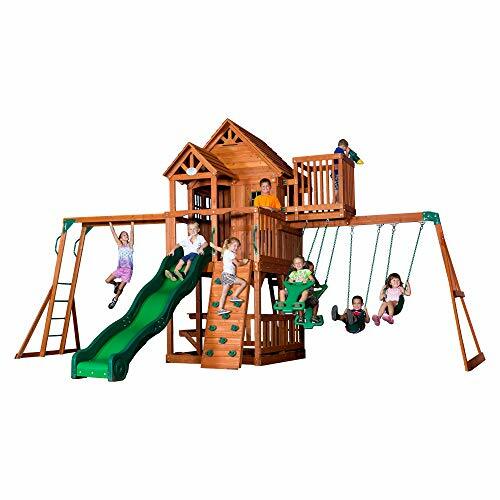 The set includes two swings, a slide with handrails, a climbing wall, a rope ladder, and a clubhouse with a roof, and it can accommodate four kids weighing a maximum of 60 lbs each. Bring the set home for less than $600! Turn your backyard into the ultimate playground with this playset! 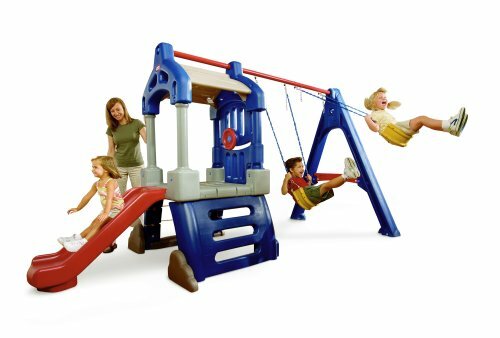 Priced at around $1,500, it comes with two belt swings, a swing glider, a ten-foot slide, a rock climbing wall, and monkey bars. There’s also a clubhouse with a wood roof, complete with a covered entryway and a balcony with a telescope; beneath the clubhouse, there’s a picnic table and bench along with a sandbox. 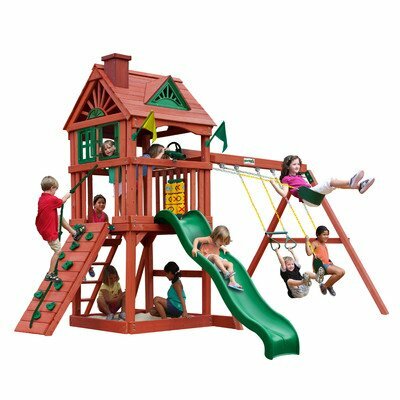 Use our list of the best backyard playsets to choose the right product for your kids and for your budget!